In my recent updates I've been teasing a new Animation 4 Business Promotional video created with Reallusion's iClone 6. It's taken me longer than expected because I've only been able to work on it for a couple of hours each day - part of my new schedule that enables me to work on many projects concurrently. Finally the animation is finished and, although I've already debuted it on the Animation 4 Business website, Facebook and YouTube, here is the only place you can read about the behind the scenes creation process. The finished video is below. The main character is a custom design made from Reallusion's ToonMaker pack using the 'Curvey' body type. I had to tone down the curves and try to create a more conservative looking outfit for a business video. Which is one of the great things about iClone character design. Every single body part is scaleable. You're not stuck with just the base body types in the pack. On the down side there isn't a lot of clothing options for the curvey body type. You're pretty much stuck with creating variations on the short skirt and tank top you see here on the default character body (image right). I did my best to try and make her outfit look like a kind of pant suit with a bit of a skirt around the waist. The script for the animation was written by one of my Animation 4 Business contractors, Commedus, who came up with an interesting angle to showcase a little of the 3D aesthetic by having the character actually walking on the 3D letters. In the end I made her walk along a plank just above the letters because, apart from being easier to animate, I felt she was at real risk of tripping if she tried to walk on the letters and talk to camera at the same time. It was also Commedus' idea to have the character slide down a pole to reveal the 3D title. Turns out that sequence was the hardest to animate as every little movement had to be key framed from scratch. Full set for the video. This video is actually only my second complete animation using iClone. Prior to making it I spent quite a long time (days) going through my entire iClone library just to see what I had and how some things I bought actually work. It was a real eye opener and taught me a lot about using the program. I would recommend doing that to anyone who has bought the software and a bunch of content packs to get a feel for what you have. By the time it came to designing my set I had a fairly good idea of what props and backgrounds I had and pretty much constructed the main set in half a day. Interesting to note, in the video you can see a studio camera in the wide shot towards the right of screen. This camera can actually be used as one of your cameras in the scene i.e. you can switch to what that camera is pointed at. I didn't in this video but it could be very useful for recreating an actual studio set in iClone. Originally I wanted my set to look like a film studio but didn't have the right backdrop. I found an image online and emailed the company, Parkside Mediahouse, for permission to use it. Unfortunately they took a little too long to reply. I really wanted to put this video to bed so I bought the empty building background you see from Pond5, a royalty free image stock library, for a few dollars (even cheaper thanks to Nerdist and their Pond5 promo code). Typically, just as I finished the video, Parkside Mediahouse got back to me saying I could use their image so long as I included a credit and link to their site. So I decided to create a second version of the video with the original background. You can see this below at the end of this post. For this particular animation I didn't hand draw my storyboard. Instead I went straight into iClone and actually posed all my key frames and then took a snap shot. Supposedly this would mean I could animate from key pose/scene to key pose/scene but it didn't quite work out that way. iClone allows you to give your characters pre-made movements. The problem being that if the movement went for longer than the scene it would overwrite all the key frames in the next scene. Not ideal. In the end I deleted all my storyboard key frames since I could use the actual storyboard for reference anyway. Key framing the pole slide dismount. As mentioned previously some scenes were key framed and animated from scratch. Mainly the sliding down the pole action. Everything else was a combination of pre-animated motions modified slightly to fit the scene or direct puppeting. 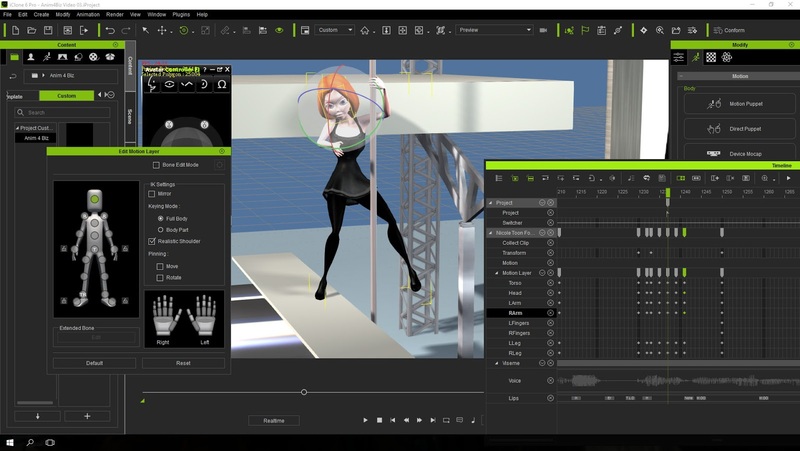 Direct Puppeting is where you set up a looping action using either the mouse or slider controls then record that action live for however many frames you need it to repeat. In the next pass you can then go back and modify various movements to better match the character's speech etc. Most of the facial movements were direct puppeted too as ToonMaker characters aren't compatible with the iClone character facial expression system, though fortunately they are compatible with the auto lipsyncing feature. To animate the facial expression on ToonMaker characters you use the Avatar Controller Plug in which animates entire expressions or just single face components. Since I was given permission to use the studio background photo I wanted to make sure I used it. However, I'd already released the first version with the empty building background and didn't want to pull it down as I quite liked it. Instead I came up with the idea to not just change the background but also the character to show how easy this is to do. You can literally swap out the old character on the first frame with a new character and everything else will stay the same. Very handy. Watch the second version below. I think that is pretty much it. I know the animation is probably not as well executed as it could be. It is only my second full production in iClone. I'm sure I'll improve. It does achieve the purpose of demonstrating the 3D animation like this can be produced at a relatively low price. Hopefully it will help to inspire some businesses to give it a try as iClone animations are fun and challenging to put together and gives very satisfying results that is a bit different from the usual animated explainer video. I think both versions came out great! I am glad I could be of assistance with it. Look locally for other small business and home business organizations that meet in person. Either way you go, networking with other business owners gives you an excellent support system. These are some good business strategy that I am thinking to do on my website of animation video services . I was doing research on this thing couple of days ago now i found something to relate to me.